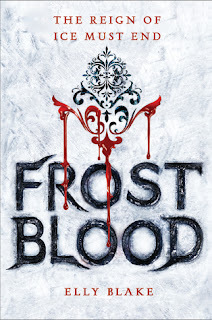 Thank you so much to the amazing people over at Hachette Books Canada for sending me an Advance copy of Frostblood for review! Now let me tell you all first, that if you didn't know, I generally have a hard time enjoying Fantasy or anything that isn't romance based...However I LOVED reading this story so much, I literally cannot wait to get my hands on book two in this series! You know those type of books that you try to slow down, so you can enjoy it more? Yeah, that was one of those books!! So right from the beginning you know exactly where Ruby is and what she is going through, and I found it really easy to follow along with the story! It was so fast paced, and kept me on the edge of my seat from beginning to end! I will say that for me, I felt like there could have been just a little bit more. I am sure that book two and three in this series will be much more because you aren't having to learn about the history and reasons why these two different bloods don't get along. I was just hoping that it would have more action earlier on, and maybe just a little more sizzle between Ruby and her love interest. I so loved the idea of fire and ice as two different worlds/bloods in this novel, and I found it so compelling to read, because there were so many times where I felt like I was in the story and could see the ease and struggle happening. From the beginning Ruby is in a way linked with a frostblood, and you really see the attraction from the start, even if it isn't necessarily evident. I love the push and pull factor of these two. You feel the intense emotion between them, regardless of how different they are! Speaking of, can I take a moment to just appreciate how well written Arcus was in this story! 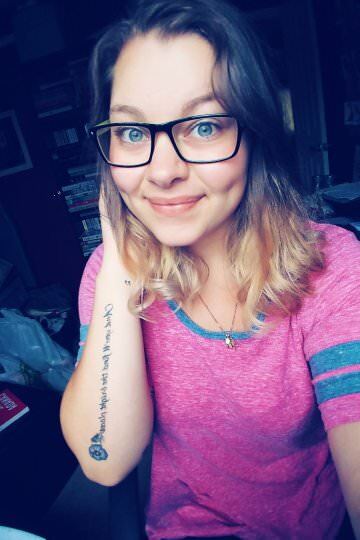 I sort of went though it on Twitter, but those eyes!! #Fangirling! "There is always a light in darkness. It may only be a pinpoint, but it is there. Follow it and you will find your way free." Throughout the story you see Ruby already knows who she is, so you don't have that questioning about how she never knew she is a fireblood. You do however, see her struggle and strength prevail throughout! Even though she may not be physically strong, you see the inner strength and power she has, and gains from everything that quite literally gets thrown at her! She really goes through a lot in this novel, and I really felt a lot of the emotion coming out for certain scenes, and it was really affecting! I loved all the action filled scenes, where you get to see how badass Ruby is! Talk about strong female characters!! Just when you think that it's over, and she has figured it all out, new twists come to the surface and more difficulties come for Ruby. I couldn't stop reading, and I swear in the last few chapters, SO MUCH happened! It was intense, fast, gruesome, and just amazing! I really can't wait for the continuation, because it left me wanting more!! "It seemed that as I willed my mind to calm, it became a raging torrent of jabbering nonsense, intent on irritating me into a state of fury." "I'm not scared of your scars." "I have grown accustomed to holding this particular bundle of crackling firewood." Honestly, I really enjoyed reading this book! I'm so lucky and grateful to have gotten a copy to review, and I really cannot wait to read more of Ruby, Arcus and both bloods! It was so fast paced, it was raw, powerful, emotional, and so much more! I don't think I've really enjoyed fantasy book in a long time, so I definitely recommend picking this up! Overall, it was a great read with so much packed into this book! When you think you've got things figured out, more information pops up and it leaves you wanting to keep reading to see where it goes and what's going to happen! The ending was so incredible!! That's all for my review of Frostblood by Elly Blake! I hope you enjoyed it and add this to your TBR!